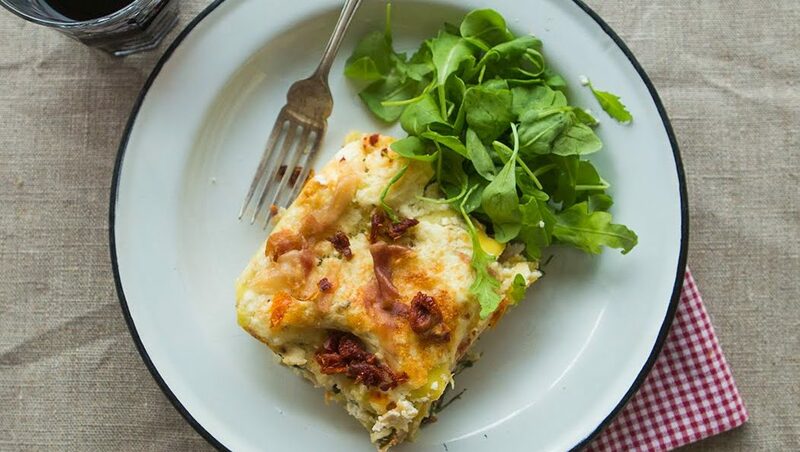 Lasagna with Parma ham ricotta and sun-dried tomato – a classic with a little Chiappa twist. Our recipe is quick, easy and low-prep. MIX together in a bowl the ricotta and 200ml of milk then season with salt and pepper. COVER the bottom of a 20x20cm ovenproof dish with a thin layer of the ricotta sauce. WHITE layer : first the pasta sheets, then the ricotta sauce followed by a sprinkle of Parmesan cheese. GREEN layer: a handful of rocket. REPEAT this procedure to make another two layers. FINISH with the ricotta and parmesan cheese. POUR a splash of additional milk down the four corners of the lasagna dish to add a little moisture to the dish and to keep it from drying out during cooking. COOK in the oven at 180c for 30-40 minutes until golden brown and bubbling.